Edwin “Eddie” Jennings Sligh, 96, passed away Monday, November 12, 2018 at his residence surrounded by his loving family. Born April 18, 1922 in McColl, SC, he was a son of the late Charlie O’Neal and Myrtle Freeman Sligh. Eddie attended the Presbyterian College and was a retired Carpenter. 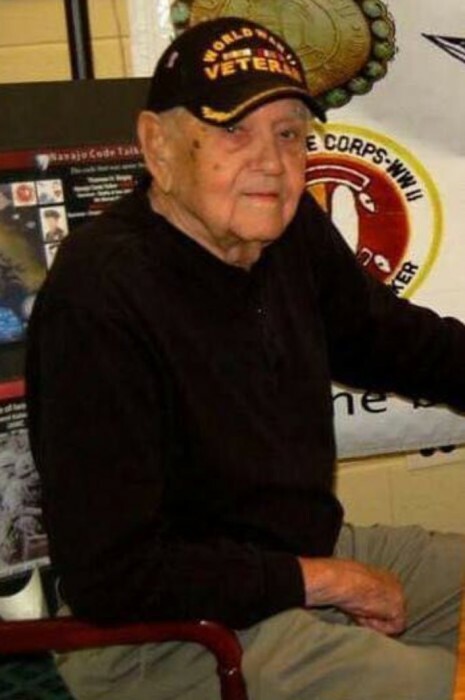 He also was a World War II USARMY veteran. He was a member of McColl First Baptist Church. He enjoyed traveling, especially to Key West, photography, watching sporting events, doing crossed word puzzles. Eddie loved his country and fellowshipping with other veterans. He was on the honor flight that carried World War II veterans to Washington, DC in 2010. He was preceded in death by his parents listed above; brothers, Eugene Sligh, Billy Sligh, Freeman Sligh, and Carlton Sligh; sister, Laura “Sister” Sligh Weikel; wife, Helen Hurley; special friend, Linda Priest. He leaves behind to cherish his memory: his daughter Candice Thompson of McColl; sister-in-law, Barbara Sligh of Wilmington, NC; 2 grandchildren, Carmen Driggers and Clay Thompson (Brodie); 2 great grandchildren, Tyler Beaver and Cameron Thompson; a host of nieces, nephews, and great nieces and nephews. A funeral service will be held 2:00 pm, Saturday, November 17, 2018 at McColl First Baptist Church, with burial in Beaver Dam Cemetery, officiated by Rev. Jerry Springs. A visitation will be held from 1-2pm at the church prior to the service. Memorials are suggested to: McColl First Baptist Church, 220 N. Main Street, McColl, SC 29570. Rogers Funeral Home is honored to assist the Sligh family.